Removable head assembly attaches to handle for easy storage! 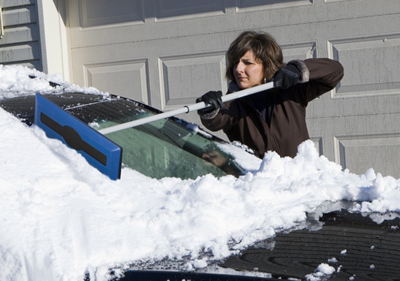 Quickly and easily remove snow and ice without scratching paint or glass! The Snow Joe Telescoping Snow Broom is designed so it won’t scratch your paint! The durable reinforced molded polyethylene foam head has been tested for non-abrasiveness, freeze resistance, center load stress and durability to achieve the highest ratings. The high-impact plastic face plate is recessed into the foam to prevent contact with the vehicle. The Snow Job Telescoping Snow Broom is an Auto Geek’s dream come true! The Snow Joe Telescoping Snow Broom weighs only 1.2 pounds, making it easy to manage for people of all ages. The telescoping handle extends up to 49 inches, providing maximum reach with no strain on the operator. The Snow Joe Telescoping Snow Broom is great for cars, trucks, SUVs, vans, buses, trailers, and more! If you thought the Snow Joe Telescoping Snow Broom couldn’t possibly get any better, you were wrong! At the end of each Snow Joe you’ll find a rugged ice scraper to assist with ice buildup on your windshield. When you’re done with the Snow Joe, simply detach the head and snap it onto the handle. There is no faster or easier way to remove heavy, wet snow from your vehicle – period! Works better than the conventional snow brush. This blade its simular to the one the car dealership use on their cars. Easy to push light snow off the car/suv. Would be nice to be able to tilt or not tilt but works well. ProsLightweight, easy to push, take apart for easy storage. ConsCan't tilt at all. Wider scraper would help too. I thought this would be a great item. Last year I scratched my truck pushing snow off with a pushbroom. 2.99 Snowbrushes from Walmart outperforms this piece of junk. The screw cap that the head mounts on was not secured to the shaft and so the head spun freely till it just pulled out altogether. The anchor in the extendable handle came loose and handle is now in 2 pieces... and the snow scraper on the end cracked the first time I tried to scrape my windshield. Unbelievable as it sounds this all happened within first 10 minutes of use. IT WAS LIKE A BAD COMEDY SKETCH. Cheap made in china junk, or everyonme on the assembly line was drunk the day this one got made. I looked around for the camera crew and waited to be told "you've been pnnked"
Prossoft pusher does not scratch, if only it didn't fall off the pole. The hand scraper with the brass scraper that was bundled with this is great. Consterrible construction falls apart in seconds, what a joke. Recommended to a few people, when you have FEET of snow on your car, accept no substitute.